One of the joys of running this blog is that I am occasionally invited to product launches and events, there’s something about free food that just makes it taste better. 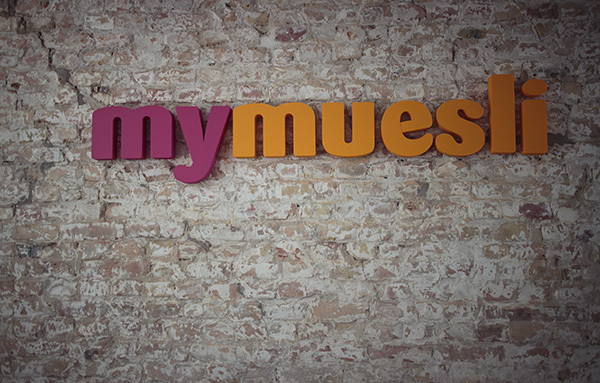 Recently mymeusli.com invited me to partake in an open day at their offices to sample their gluten free muesli options, great! 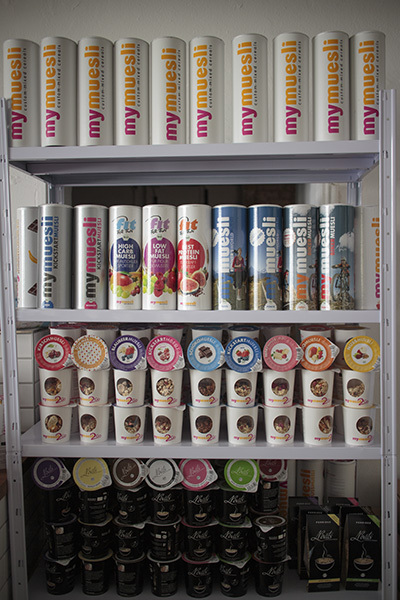 After some introductions and other niceties I noticed a rather large selection of tubes, all containing muesli goodness. I was definitely being optimistic and hoping that they would be mostly gluten free. Unfortunately, this was not the case. Not really their fault, but mine. I always rate the importance of a company providing Gluten Free products in line with the importance I place upon eating said Gluten Free products. If only the world agreed. They do, however, have a couple of tubes of glutenfrei goodness, helpfully coloured in such a way that they stand out from the rest of the line. The two options are berries and chocolate, the two best additions to any breakfast in my opinion. 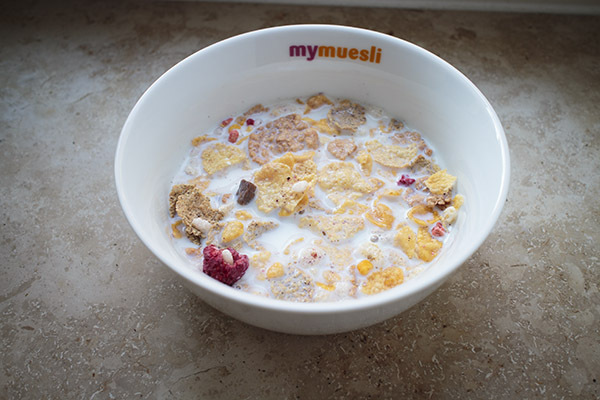 The muesli itself is rather good, much better than the dusty offerings from Verival, Herz or Hammermühle. It is less prone to crumbling and has a little more flavour to it. All in all, I’d recommend buying some. 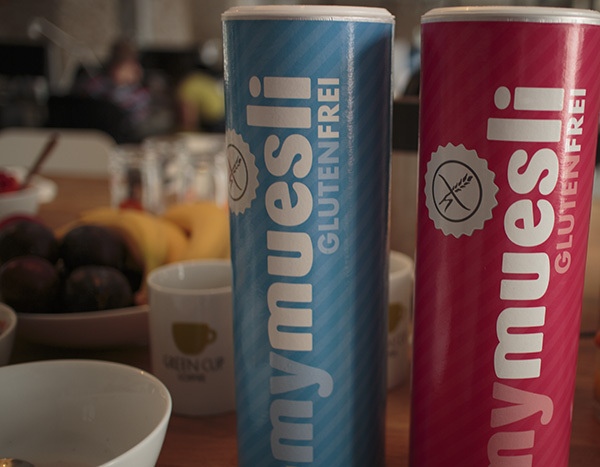 Unfortunately mymuesli were not able to provide a list of places you could buy the Gluten Free tubes and so far I have only seen them for sale in my local Rewe. So, I’d keep an eye out for them, but it may be best to order online. Website – They can be a little hard to find on the site, but there is a link at the very bottom of the page. 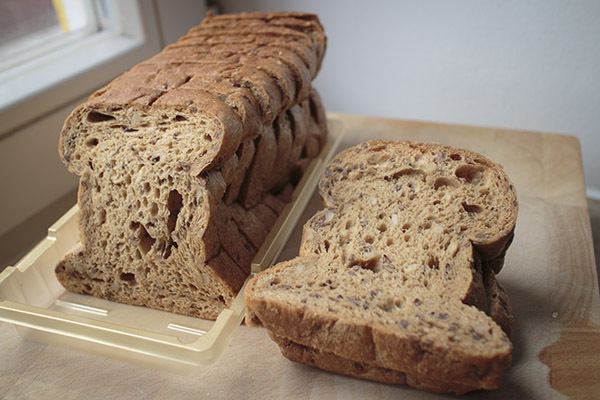 I often lament the state of gluten free bread here in Germany, but, if you ignore the bricks made of rice whose recipes haven’t changed in 10 years, it is possible to actually find something decent these days. Thankfully, due to this blog, a little while ago I didn’t even have to go and search for some. 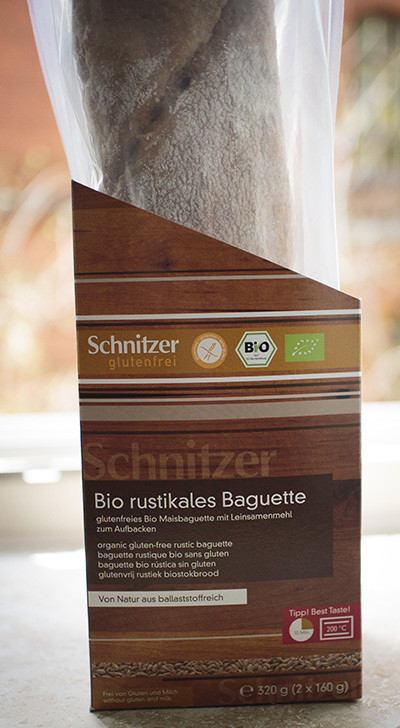 I just received a package in the mail from Schnitzer one day and much to my delight it was filled with their new range of breads! As ever, at first I was skeptical, another bread, why, it’ll be the same as all the others! But my negativity did not last long and I soon broke into the Bio Focaccia. They come in a pack of 4, separated into pairs in their own container, I assume to help with not stuffing your face like a maniac 4 at a time. 10 minutes and 200 degrees later, I had these on my plate. Granted, they are not much to look at, and to be honest they were a little on the thin side. But they tasted pretty good, even if a little chewy. In a pinch I’d buy them, but if I had the option I’d plump for the Schaer alternative, they’re a bit more bread like. Next up were a range of three types of baguettes. For starters, I went with the classic. They come in their own little cardboard container with the two baguettes wrapped individually, a thoroughly sensible decision. After a little baking (which is a must with any of the commercial gluten free offerings) I had this little twist of food. Inside it was pretty soft, not chewy, not dry and it also had a pretty good taste to it. Happy, it is good bread, but I was not amazed. 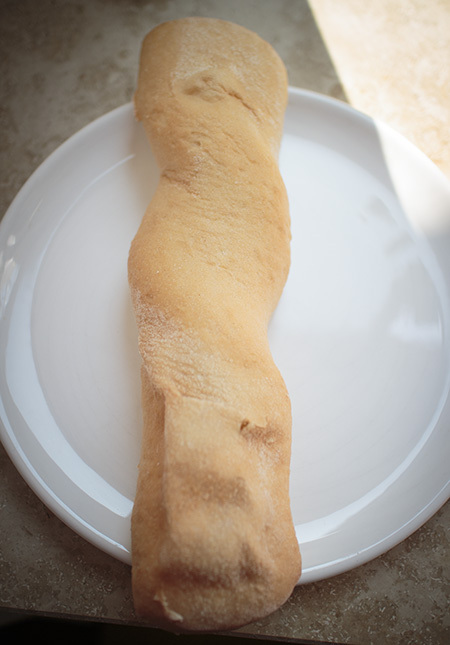 Next up came the rustic baguette. Rustic is what is says and rustic is kind of what you get (I’ve never been too clear on what exactly rustic is, and never cared enough to actually find out). This one was a definite improvement on the already passable classic baguette. It had a much better texture and taste to it, whilst keeping and nice soft moist interior. Finally I came to the pinnacle, the Grainy baguette. It certainly sounds better, but then I’ve always had a thing for grainy bread. Happily it was rather sublime, maintaining the soft interior, complete lack of a sandcastle like texture and a superior taste. I was hard pressed to tell the difference between it and the memory of ‘real’ bread I contain in my head. 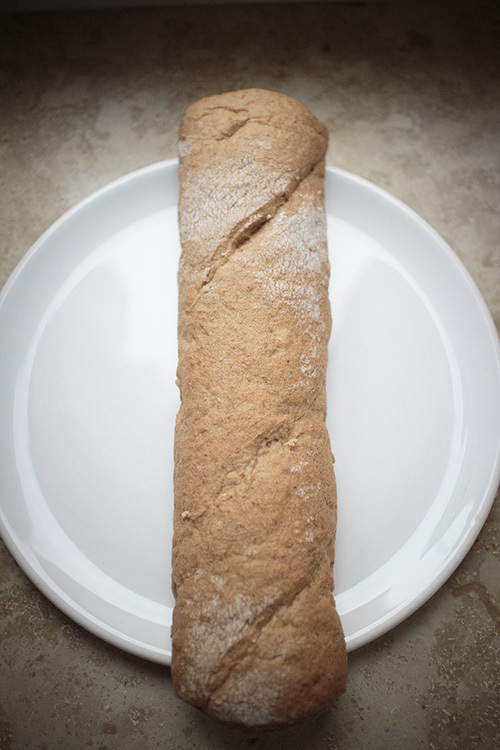 In conclusion, go and buy the grainy baguette now, if not find the rustic and be content that they’re pretty damn close to the real thing. Available in most places that sell the Schnitzer range. For some reason, when I saw that Rewe were offering their own brand of gluten free products, I wasn’t expecting greatness. I hoped, as always, that it would surprise me and be good, although I expected disappointment. 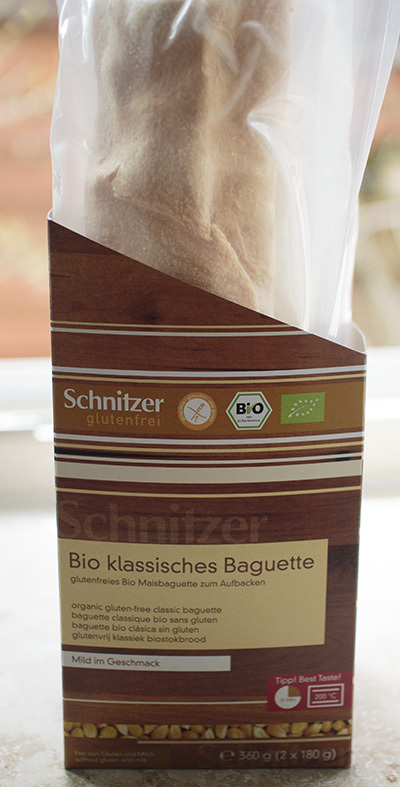 But, I may have been burned too many times by buying a new variety of glutenfrei bread, taking it home and discovering it was lacking in many ways, so I thought, what the heck, lets buy some and give it a try! Now, if this review was a hollywood romantic comedy about falling in love with bread, I’d be saying ‘well, after I tried it I had a huge surprise! it’s actually amazing’, but alas, this is the real world where disappointment exists and the end result was somewhat terrible. As you can probably tell from the picture, it’s solid, dry, has an air of staleness and is very prone to crumble into dust. Plus, the slices themselves are rather tiny. 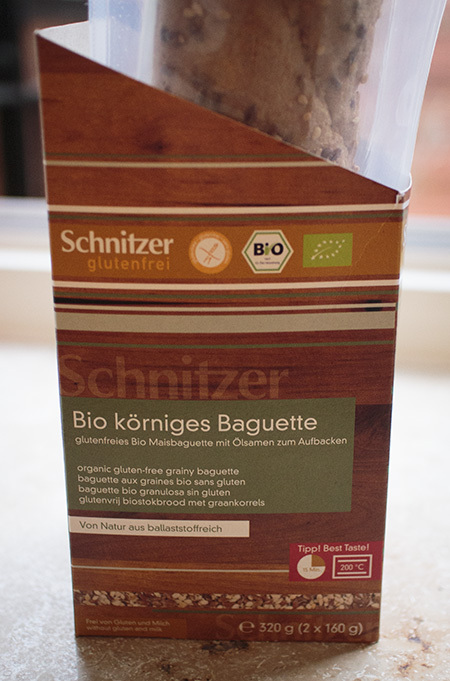 Now, don’t get me wrong, I love the fact that Rewe is accommodating us gluten afflicted, they ARE making an effort and their range is pretty good. I just wish it was something better and not more of the same. In conclusion, I cannot recommend it. One of the larger pains from being one of the gluten afflicted is that most ready meals are out of your reach, they often contain some form of wheat, mostly as it’s a cheap way of packing out cheap food. In some ways, it’s a benefit not being able to eat such things, it leads us to eat fresher and healthier food, even if we have the slight downside of mostly cooking it ourselves. But, there are those occasions when you simply do not have any free time, you’re in a rush and need something quick and easy. Thankfully, there are some gluten free ready meals, of a sort, available and I received a couple of them through the post (along with a small red hedgehog cheese grater) from the Swedish brand Semper. The first I tried is the Fusilli Funghi. I was a little concerned with the small packet, ideas of a single serving vary from person to person, plus with the amount of water the instructions required, it looked a little odd in the pan. But, as with all ready meals, some faith is required that the end product will appear. Thankfully, the water soon thickened and this is what popped out at the end (with a little cheese based assistance). All in all, it was good enough, especially as I had to put no effort into making it atall. I’d forgotten such a simple pleasure. The second packet was a Penne Carbonara. I had much the same thoughts, but was a little excited to see the word ‘Bacon’ on the packet. The little brown squares are said bacon. It could of been worse. The end result was pleasing enough, again, with the ‘no effort’ part enhancing the whole experience. In conclusion, they are quick, easy, taste as good as you’d expect any ready meal to taste. But as they’re about the only gluten free version of a pasta ready meal, I’d definitely buy a few to stick in your cupboard. A side note though, I have yet to spot them for sale in Berlin, so your only option may be online purchase. If you have spotted them, please comment on this review so others can find them too. 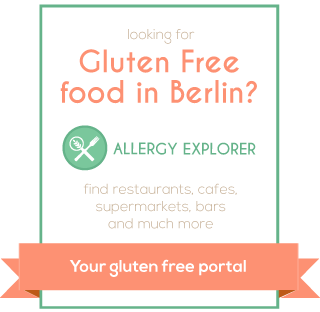 If you’re a regular reader of this blog, you’ll know that I’ve never been impressed with the gluten free bread offerings here in Germany. Generally they’re all sturdy lumps of bread with a stale consistency, which, upon entering your mouth, crumble into a powdery dust. But, thankfully, things are changing, even if a little on the slow side. 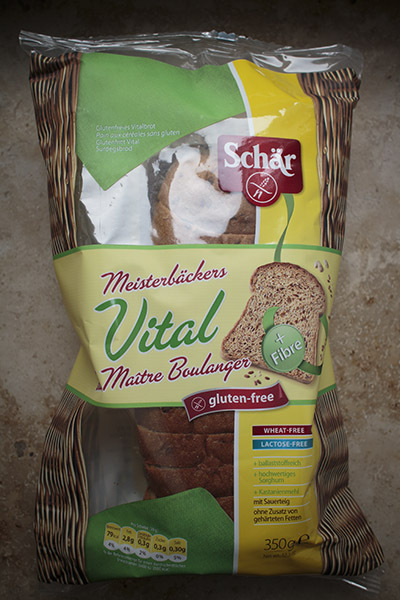 A while ago I came across a new offering from Schär on the shelves of my local reformhaus (it’s hard to miss as it comes in it’s own giant balloon like package) and promptly purchased some with the notion that it would be the same as all the previous offerings. Passable, but not great (my positivity that it’s worth buying new breads, as they may actually be good, mixed in with my negativity that all gluten free bread here is generally bad). So, when I actually tried some, I was pleasantly surprised. It’s soft, fairly fresh and doesn’t crumble too much. 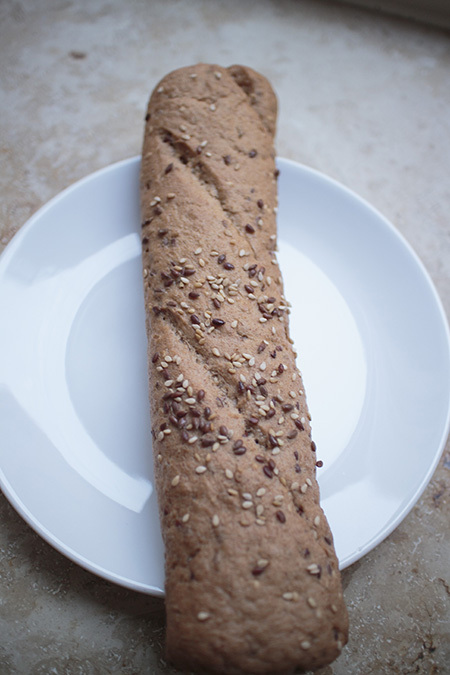 On my personal scale of ‘Compressed Sand’ to ‘Are you sure this isn’t gluten bread?’, it’s up there, around the 8.5 out of 10 mark, and it’s definitly the best glutenfrei bread I’ve had here. The only grumble I have is that you do not get many slices, but it’s not the end of the world. In conclusion, yes, buy it, although expect to be mostly satisfied rather than amazed. 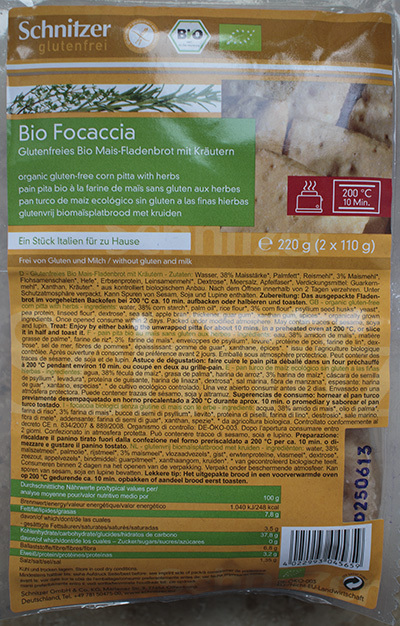 I like walking into a shop and being surprised by a new item of gluten free food, something that I was not expecting, it completely cheers up my day, especially if that new food is something that you couldn’t buy previously. Now, you may be thinking “well, that’s just a simple packet of two gluten free bread rolls, they’re available everywhere are they not?”, and I don’t blame you for such a thought, I had the same one when I first moved here. But, for some reason, they were not sold here. 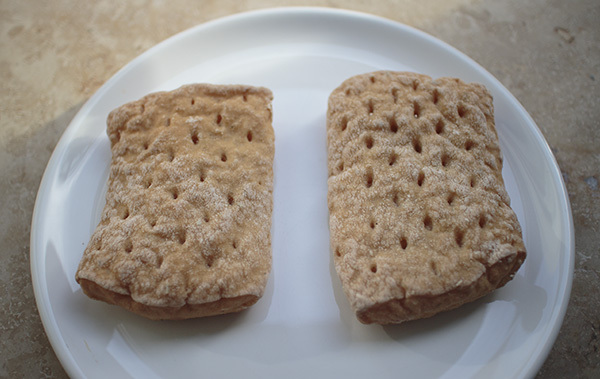 You could buy tiny rectangular rolls, which whilst tasty and good, were not suitable to put a burger in. I do not know why this was the case, I am just happy that it is no longer. The buns themselves are pretty good in terms of glutenfrei products here, although, as with all gluten free bread here, it is a little on the hard and crumbly side. Thankfully, not too crumbly though, not enough to cause a bother at least. Certainly not enough to stop you grabbing as many as you can and being happy you can eat a proper burger again. In conclusion, I’d recommend them, even if mostly for their bun-ness. Available in : Quentin Reformhaus Alexa and many other places.